Join us for a packed day of masterclasses and workshops for all harps, all ages and all levels by top international artists: Sylvain Blassel, Karen Marshalsay, Tara Minton, Lucy Wakeford and Hugh Webb plus our own Harp Department Eleanor Turner, Katherine Thomas and Junior Conservatoire's Vera Khait. 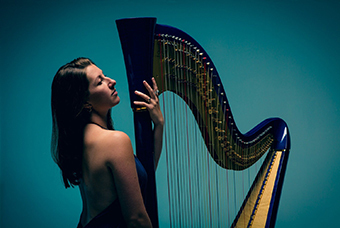 Followed by a public evening concert in the Elgar Hall at 7pm by acclaimed French harpist Sylvain Blasseland, Australian jazz harpist and singer Tara Minton. Visit our Facebook page 'Harp at Birmingham Conservatoire' and follow us on Twitter @birmharp for more details.